Applets cover everything from your GitHub repository status, to project management notifications from Jira, ZenHub or Azure DevOps to priority emails from your boss or your Mom. It will tell you if your website goes down or if an answer to your question is posted on Stack Overflow. You can even set it to remind you to stand up every hour to stay healthy. Q applets connect to leading applications used by millions of developers. All Das Keyboard applets are open source. Developers can easily create their own using the Das Keyboard Applet open API. Not only the Das Keyboard 5Q sports the most advanced software, it pushes the limits of what hardware and electronics can do. Type at the speed of thought, instinctively moving words directly from your brain to your computer. Faster, more accurate typing, much brighter RGB lighting and unsurpassed 100 million keystrokes. It detects key presses in 0.4 milliseconds and reports it to the computer within 1 millisecond, up to 45X faster than other mechanical keyboards. Brightest RGB and most advanced switch design delivering 16.8M intense RGB colors. Supports unlimited lighting profiles, in which you can customize a host of controls specific to a program or game. A very soft silicone based detachable wrist rest that magnetically attaches and helps typists rest their wrist comfortably. 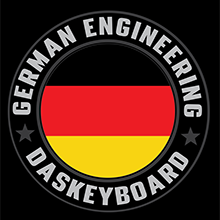 German engineering stands for precision in the design and what you feel on your keyboard. Made with the world's best electronics and top quality materials. The Das Keyboard 5Q with full n-key rollover (NKRO) scans each button press individually. As a result, every pressed key is noted, even if you are pressing a bunch of keys simultaneously.